This month’s Spirit of the Month is a relatively new player on the blended malt block – especially when you consider the long history of its components… Monkey Shoulder is a blend of three of Speyside Scotland’s most prestigious single malts – Glenfiddich, Balvenie and Kininvie (interesting fact: Kininvie was once a secret distillery within the grounds of Balvenie). William Grant & Sons (WG&S) Master Distiller Brian Kinsman has the distilleries of WG&S at his disposal, and selects finished product from Glenfiddich, Balvenie and Kininvie, based on their flavour attributes, and what they can contribute to the Monkey Shoulder blend. Without any monkeying around, these are then aged for a further three to six months after final blending in first use ex-Bourbon casks. All components are the minimum 3 years required for Scotch whisky. 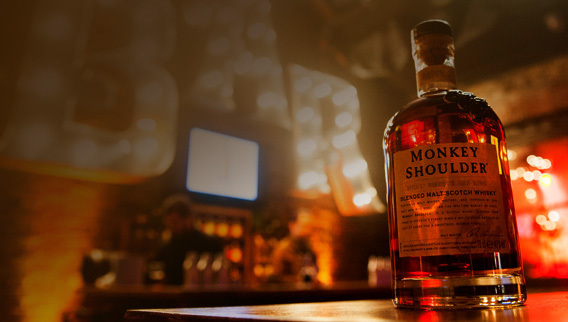 We love Monkey Shoulder for a whole host of reasons… but overwhelmingly it is excellent value for money when you consider the skill and resources that are employed in its creation; it’s an elegant and rich whisky - both complex and balanced, but most of all, it’s a taste of the rugged moorlands of Scotland. Want to know more about great Whisky? Join Us! ‘Monkey Shoulder’ is a term given to the condition that the maltmen (they turn the barley (with shovels) at the distillery) picked up over time, where the right (or favoured) arm would eventually hang lower than the left, from repeated muscular action on that side of the body. Monkey Shoulder whisky was spotted in a prominent position on the bar in the final season of True Blood – turns out even werewolves and vampires drink the stuff.